Reconstructive surgery also includes other procedures to correct occlusion, augment bone and soft tissue, and replace diseased functional components such as the temporomandibular joint. Dr. Bates has extensive experience with distraction osteogenesis, a method of gradually extending bone using distraction forces. 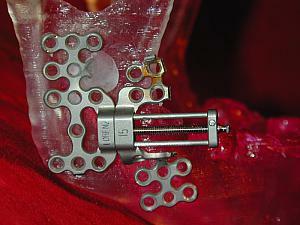 Dr. Bates was among the earliest adopters of the techniques of distraction osteogenesis to grow new alveolar bone and lengthen deficient bones such as the mandible. "We developed an intraoral procedure totally avoiding the developing teeth, based on a nerve-sparing ramus osteotomy which became highly successful for lengthening the mandible in growing kids"
Distraction osteogenesis involves growing new bone to add length, height or width to the upper or lower jawbones. It involves a surgical procedure to make a series of cuts, or osteotomies, in the bone, to separate the bone into segments. This is followed by a short healing or latency period of about a week. Then, using a small device called a "distractor" which is anchored to the bone or to the teeth, the bone is gradually and incrementally lengthened at the osteotomy site by turning a key in the mechanism a few times a day until the desired length, width or height is achieved. This is called the distraction phase. Once the bone has reached the proper dimensions in length, width or height, the bone segments are then secured in that position for a period of about three months, the consolidation phase. At the end of this period, the distraction device is removed, and the new bone is used for the indicated purpose, either placement of dental implants or ongoing orthodontic treatment. Distraction osteogenesis can be used to correct a variety of deficiencies or deformities of the upper or lower jaws. A deficient, or short, lower jaw, can be lengthened; a deficient, or narrow, upper jaw can be widened or advanced to correct a malocclusion, or bad bite. In addition, the tooth-bearing bone of the jaws, called the alveolar bone, can be augmented by alveolar distraction osteogenesis to support dental implants.